Building a new dairy can be a challenging, costly and time-consuming process. This page will guide you through the considerations and decisions required after deciding the type of dairy and yard, and their sizes. Key elements to get right are the location of the dairy on the farm, the design of the dairy and that each step of the build is done in sequence. 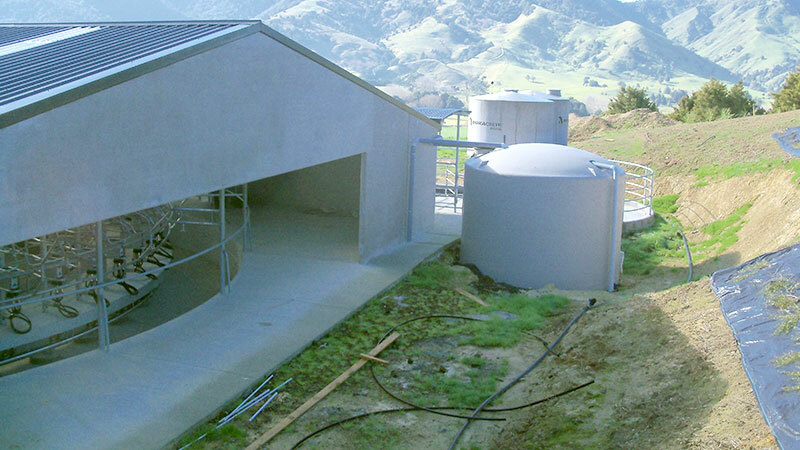 A new farm dairy or alterations to an existing dairy must be assessed to ensure compliance with NZCP1 and other relevant requirements. The site suitability, premises and plant must be assessed by a Farm Dairy Assessor prior to work starting, and on completion of the building, before milk can be collected for supply. Compliance includes the requirement that all local authority consents have been obtained e.g. building, effluent discharge and consent to take water. 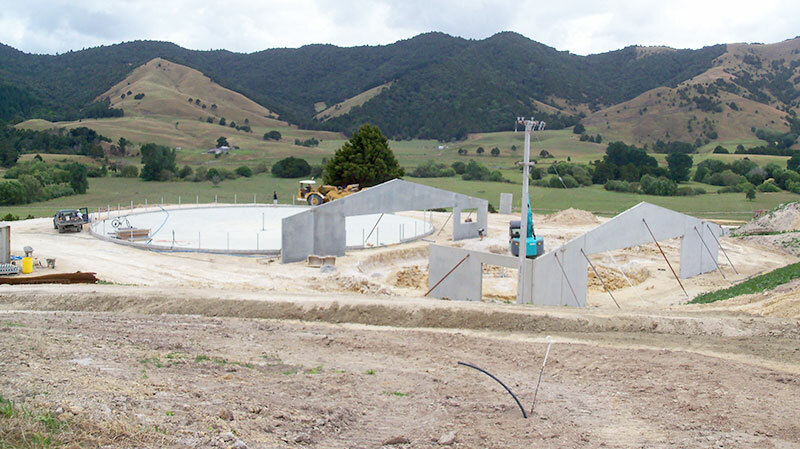 Full requirements for the dairy site can be found in Section 5 of NZCP1. Regional and District Councils may have minimum distance requirements between the dairy and land boundaries, houses, public spaces, waterways or other features. Requirements may vary from Council to Council, and rules may be updated from time to time, so it pays to check requirements and apply for any required consents early. For some sites, it may be wise to seek geotechnical advice to assess the site suitability for the building and pond placement. Soil type, strength and stability, risk of erosion, slips or slumping and any hydrological issues such as groundwater or flooding risk should be assessed. Soil types such as peat pose design challenges and risks. 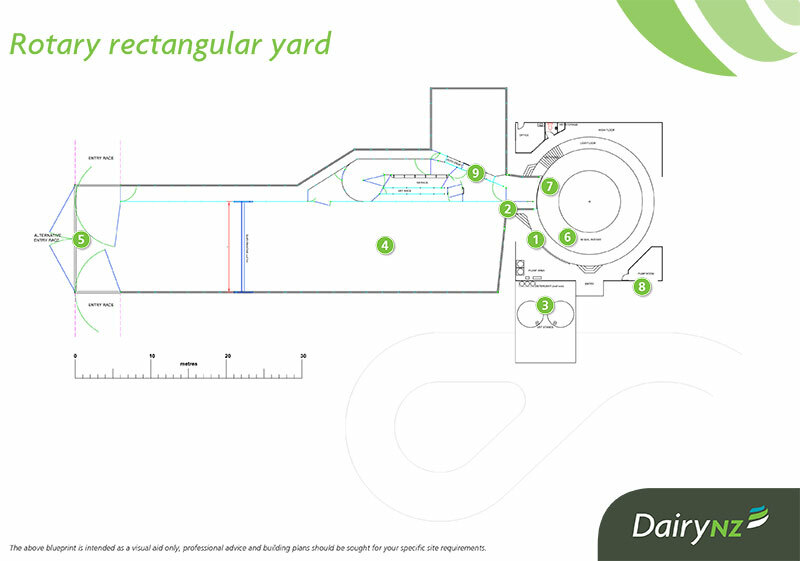 A gently sloping site is ideal for utilising gravity to convey water and effluent and may minimise earthworks to achieve desired yard and dairy levels. Using gravity is generally more reliable than pumps, and saves pumping costs. For example fresh water tanks may be able to be placed above the shed so water for the plate cooler can be fed by gravity. Washdown water could feed into effluent ponds by gravity which is turn, if sufficient head, could drive the travelling irrigator. Yard at ground level with 'pit' for the platform. Pit for the rotary platform, building and yard at ground level. The yard, and platform/bail area of the dairy will generally be of similar height. 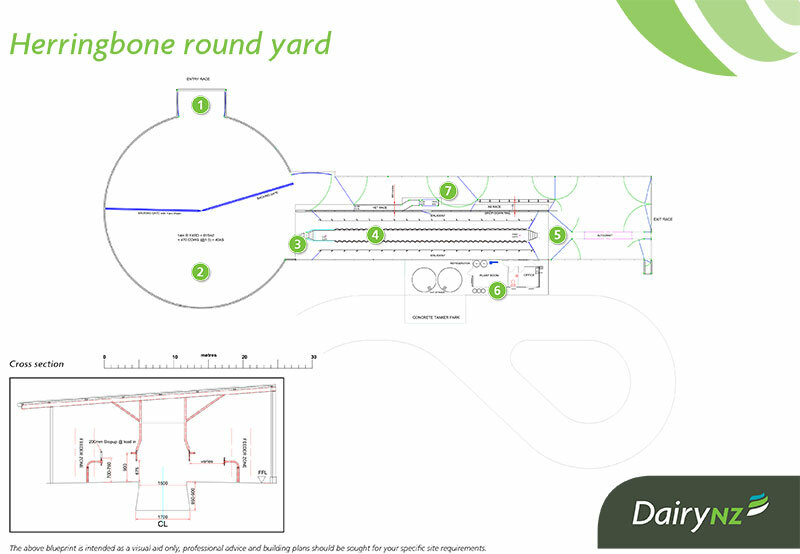 When building a rotary dairy on a flat site it will need to be decided if the yard or the milker/cupping area is at ground height. It is common to raise the yard and have the milkers area at ground height. However, less earthworks may be required if a ‘pit’ is dug around the platform for the cups-on cups-off area, leaving the yard and building at ground level. If the rotary has an internal milk line this would require a small central area to be dug. Heights between this and the effluent pond would need to be checked. Optimise the race and dairy layout for cow flow and functionality. This is of prime importance. Poor cow flow can lead to a number of issues including stock bottlenecks and excess effluent generation, as well as on-going frustration for staff. For rectangular yards, enter at the rear of the yard, either on the end of the yard, or either corner. 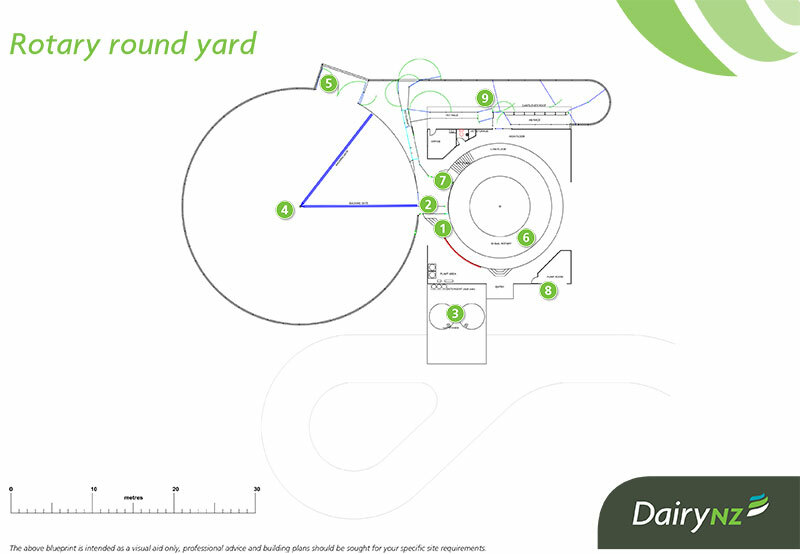 For circular yards, the entry point for should be as far from the point of entry into the dairy as possible, allowing for cows to fill the circular area facing toward the dairy. Try and minimise the amount of turns the cows need to make. For more information visit the Track & Yard section. Having open sides on the North-East/North-West sides will assist keeping the inside dry and free from algal growth but be mindful of the prevailing wind and impact on cow and milker comfort. Where possible, placing the vat stand on the South side of the building will shield the vats from sunlight for much of the day, reducing cooling energy requirements. However, most of the heat gain comes through wind not the sun if a single-skinned vat used, hence shelter is also important. The tanker track and tanker park area need to meet dairy company requirements. 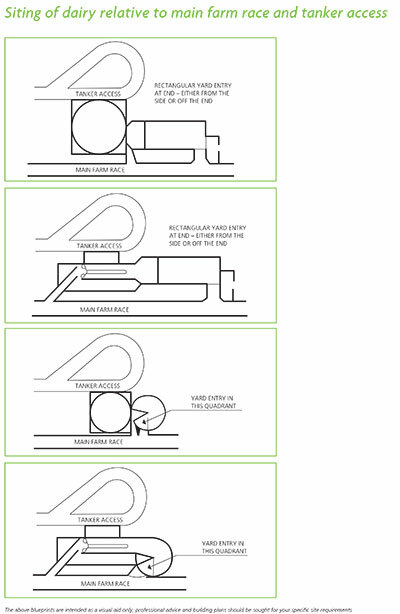 The tanker pad should drain to the effluent system, but be on a raised concrete apron to avoid drainage water from the tanker track and surrounding areas entering the effluent system. Information on dairy company requirements can usually be found in the suppliers’ handbook – check it is the latest version. As an example the 2015 Suppliers’ Handbook for Fonterra can be downloaded here. Consider proximity to three phase power, adequate potable water supply and other amenities as these can be significant costs. Ideally the site will have room for all current facilities as well as growth in the future. Preferably effluent from silage stacks, feed pads, wintering barns, and any other areas where there is effluent accumulating will be able to drain into the dairy’s effluent storage pond (utilizing natural fall and gravity will save pumping costs). You may wish to expand the dairy, yards, pad areas or ponds in the future and you will need plenty of room for vehicle access, including stock and supplementary feed truck turn around points etc. around this area. Consider adding all of these facilities into your initial design, even if you have no immediate plans to go ahead with them. Incorporating all the elements of good dairy design, to ensure efficiency and milker and cow comfort, into building plans or blueprints it tricky – particularly when building on a site with existing buildings or with challenging terrain. 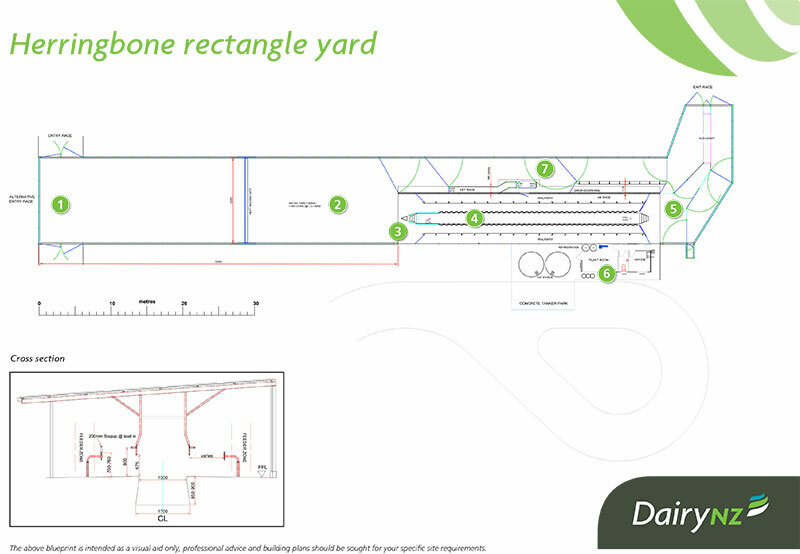 The blueprints below illustrate how elements of good dairy design are brought together. Critical areas are annotated with explanations. They are intended as a visual aid only, but should provide enough information so that when modified to suit your specific site that the elements of good dairy design can be maintained. These sections of the website contain more detailed information about good dairy design. There are many labour saving and decision support technologies on the market. Most require a significant investment so it is important to understand what a technology offers. 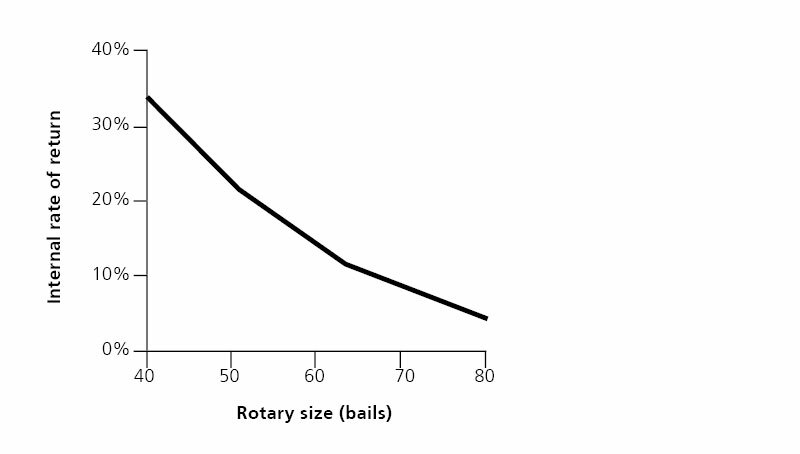 Internal rate of return for investing in automatic cluster removers (and associated labour saving technology) over a range of rotary sizes. what the full cost is and therefore whether it is a good investment for your situation. Where possible assign dollar values to calculate a Net Present Value (NPV) or an Internal Rate of Return (IRR). More information about technologies for the dairy can be found here. For example, a 2014 study evaluated the return on installing automatic cluster removers and accompanying technology (automatic drafting, teat spraying and bail retention arms) to eliminate the cups-off operator for a 770 cow herd. Labour costs were assumed to be $30/hr. More details of the study can be found here. Building a new diary can be a daunting task. In many situations it’s left up to the farmer to be the project manager, co-ordinating the dairy builder, plant installer, electrician, plumber etc. It is difficult to make significant changes once concrete is poured. Decision to build or upgrade dairy. Decision on type and size of dairy and yard and effluent system- coming up with a wish list and a budget. Develop a timeline for the project which allows for weather/seasonal challenges, consenting and due diligence time as well as any building delays. Consult with farming professionals and neighbours to review design and technology options, designers, brands and systems. Consult with your dairy company to make them aware of your intentions, and get an up to date copy of their terms and conditions of supply for dairy buildings, tanker and road entrance. Your Farm Dairy Assessor can advise on food safety requirements such as minimum distances between milk contact areas and facilities such as effluent holding areas. They will be the person who signs off on the dairy to ensure it is fit for purpose before milk supply can begin. You may like to refer to NZCP1:Code of Practice for the Design and Operation for Farm Dairies. Contact both the Regional and District Council to discuss any consenting requirements and rules around the site and building, and timeframes for the consent application process. Begin discussions with dairy designers and builders to formalise plans, budgets and timeframes (plan key milestone dates i.e. concrete poured by this date, roof on by this date, dairy completion date etc.). Engage with other service providers as required such as effluent system designers, earthwork contractors, electricity and network companies (unless you have gone with a designer or builder who offers a ‘turnkey’ package where the whole project is managed on the farmers behalf). It may be wise to seek legal advice when reviewing contracts and quotes. The two greatest risks to a new dairy build are a cost and time blowout. Hold a project team meeting before the build starts, including the electrician, plumber, builder, plant installer and effluent system designer/installer can help to make sure everyone’s requirements are allowed for and everyone is on the same page. Check in with key people involved in the project on at least a weekly basis (at least) to monitor progress against the project timeline and address any issues as they arise. Monitor monthly expenses and track against budget. Keep your bank manager in the loop if there are any significant budget changes as they arise. Satisfactory commissioning of new facilities. This should include a milking machine test and any regulatory approvals required by a Recognised Authority before final payments are made to builders and installers. Insurance in place (consider building, liability, loss of income and consequential loss cover). Check producer statements, warranties, user manuals and training requirements are organised. Debrief with project team for feedback and recommendations for those involved with future projects. The publication expands on the points and features highlighted in the designs for new dairies pages at dairynz.co.nz/dairy-type and dairynz.co.nz/dairy-blueprints.